Yoohoo! I think I've never felt busier than I did this month, and that's because we've had so many birthday celebrations and Christmas parties in our humble home. Nonetheless, it's an awesome feeling knowing that we are blessed with the love of family and friends. I go to bed feeling so exhausted every night yet my heart is full and I must say life can't get more fulfilling than how it feels at this moment right now. Since I have three year end babies, it also means I have plenty on my plate to do apart from shopping for Christmas gifts. The thing is, I still really enjoy planning for parties so you can say I'm not just doing this for the kids, I'm also doing it for myself. 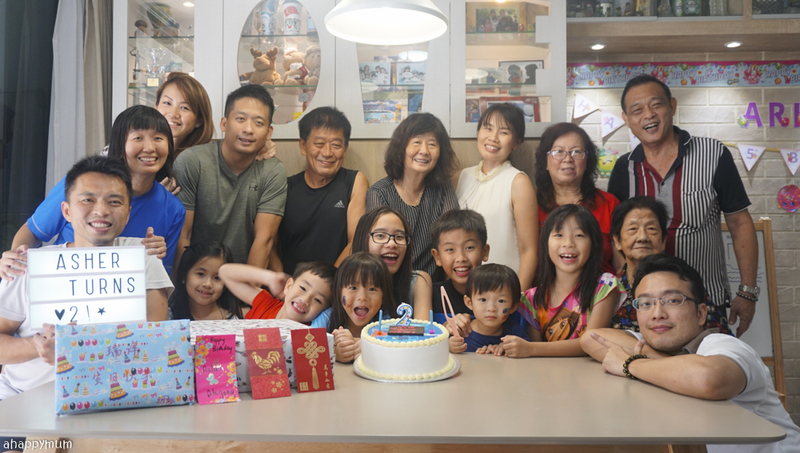 That sense of satisfaction in seeing their big smiles is unparalleled and every time I play back our videos to reminisce those growing up milestones, it just makes me glad that I was able to do a little something for them to celebrate their special days. 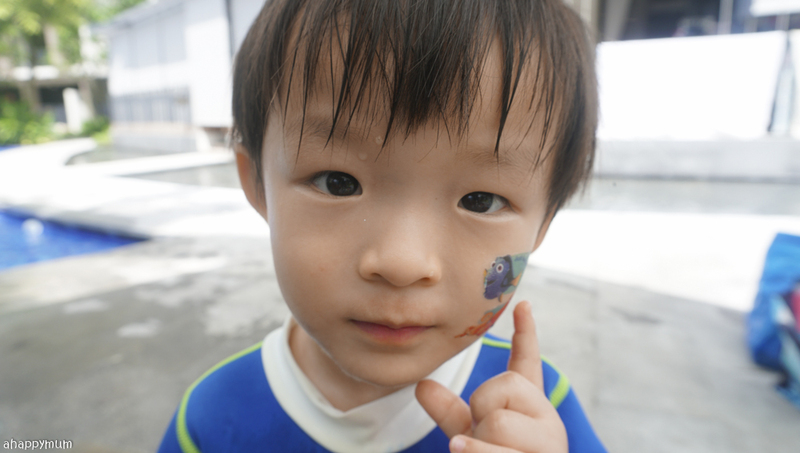 So, I'm sharing more about Asher's big day in this post. Can you believe it? My boy has turned TWO! Gosh, I still remember vividly when the moment the contractions started on this day two years ago to how I was cuddling him in my arms that very evening (read about his birth story here). Awww, my little prince, my happy boy, my bundle of sunshine is now two years old and I'm still trying to come to terms with that. Haha. Anyway, I was brainstorming for a birthday theme for him and came up with one that I thought was perfect, considering how he loves to splash in water, how we would love to have a BBQ party and how the first stuffed toy he ever won in a hook-a-duck game was..... DORY! 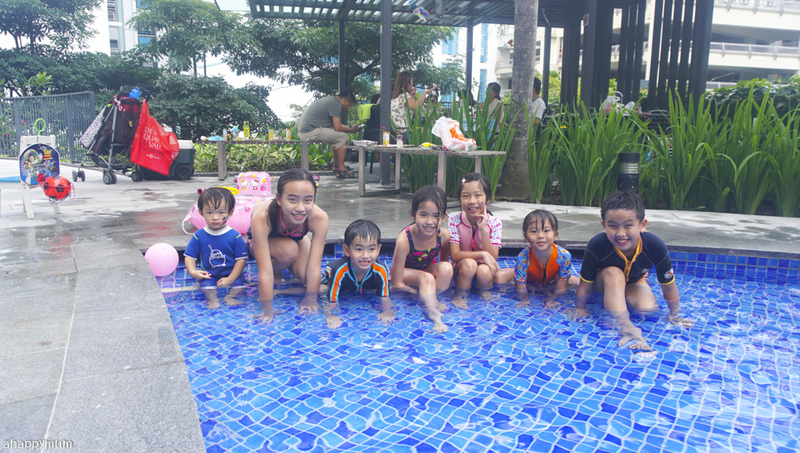 Yup, so it was time to just keep swimming and we held a simple yet fun-filled birthday celebration for our boy. Even though his birthday is only two days away from his second sister, I really wanted him to have a party of his own so I'm mighty glad I managed to pull it off (for both of them). 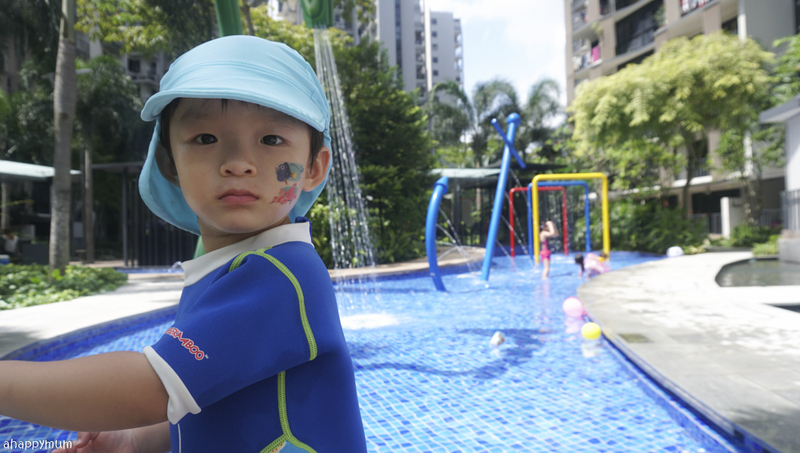 Check out what happened on the boy's big day! Now that we have this brick wall (see how it is done here) at home, it just seems mandatory that we take a family picture here on every important occasion. 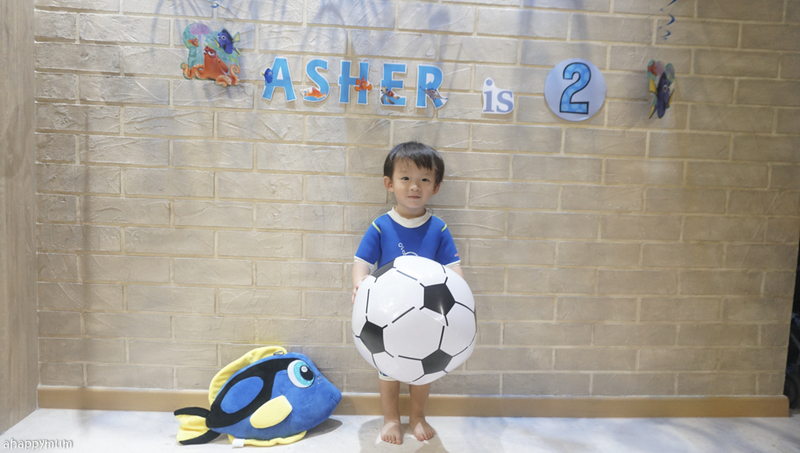 Even though Asher's party was going to be held outdoor, I still put up his birthday decorations in the house for a week or so for us to get into the mood and also to take some pictures for keepsake. 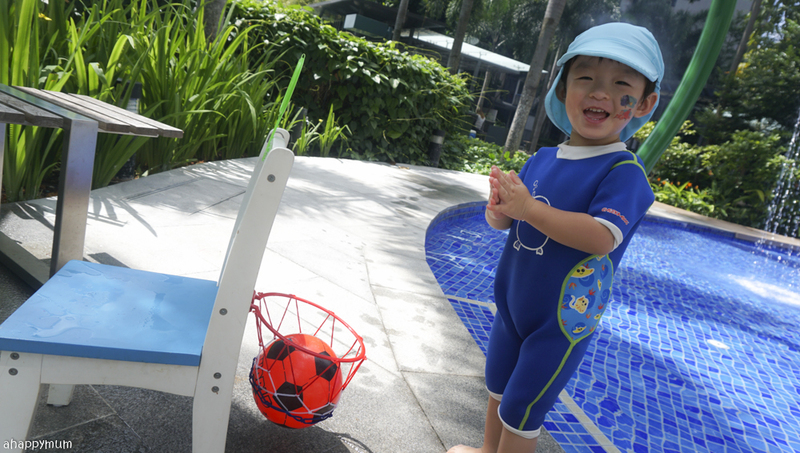 See the Dory stuffed toy that he won at LEGOLAND in his first hook-a-duck game? Yup, it's a big one! 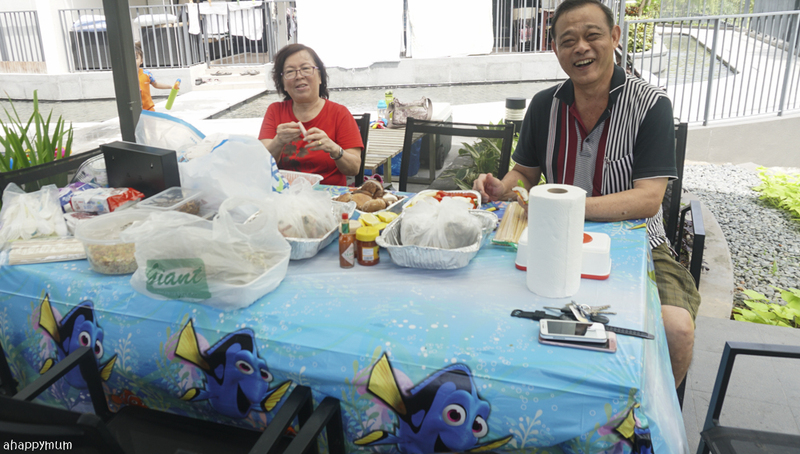 While the hubby took up the role of chef and BBQer that day (he's really good at this), I did what I could do best - be the party planner who does the decorations and take charge of entertainment. 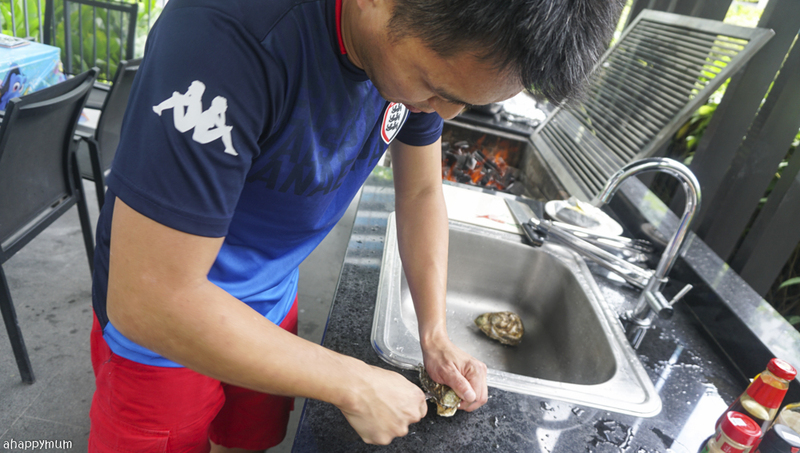 Compared to what he did like going to Sheng Shiong early in the morning to get the fresh seafood, marinating the food, setting up the fire and barbecue ALL the food, I think I got the easy part. Seriously. 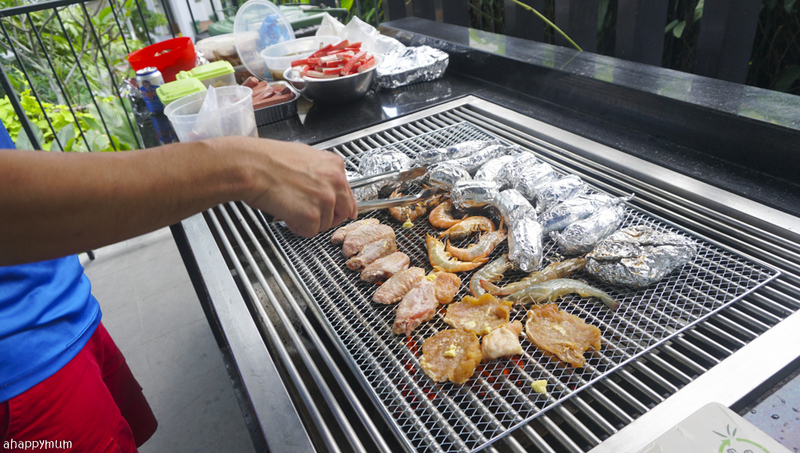 We booked the charcoal BBQ pit because we think that the food ends up being much tastier than electric BBQ. Oh yes, we didn't order stuff from any caterer since the hubby prefers to DIY, so all the BBQ food was prepared from scratch. Effort, right? 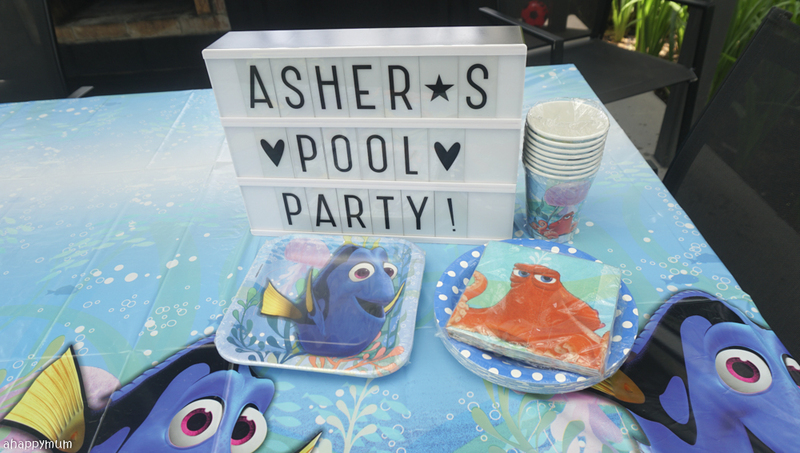 The decorations were kept simple but nice - I added a Dory table cover, paper plates, serviettes and cups, placed a personalised message on the light box, printed out his name and the characters from Finding Dory and also hung up some swirls on the roof. My advance party consisted of myself and... the kids, of course. Haha. Don't they follow me wherever I go? Anyway, the hubby and my in-laws were helping to prepare all the food so I had an hour or so to do up the decorations and games preparation. 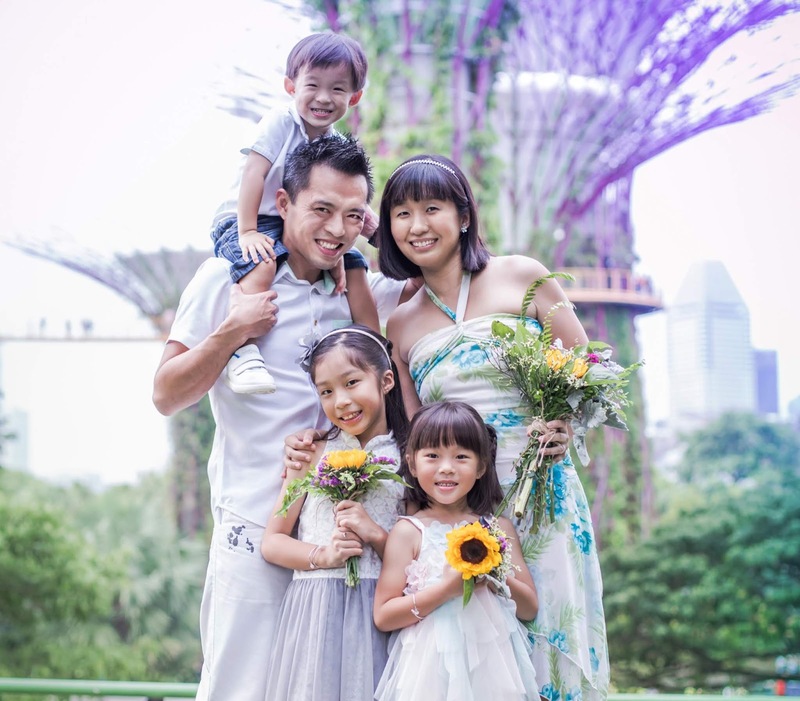 I kept everything pretty straightforward for this party because it was going to be an intimate family celebration and I wanted everyone to be able to feast, relax and just enjoy the get together. 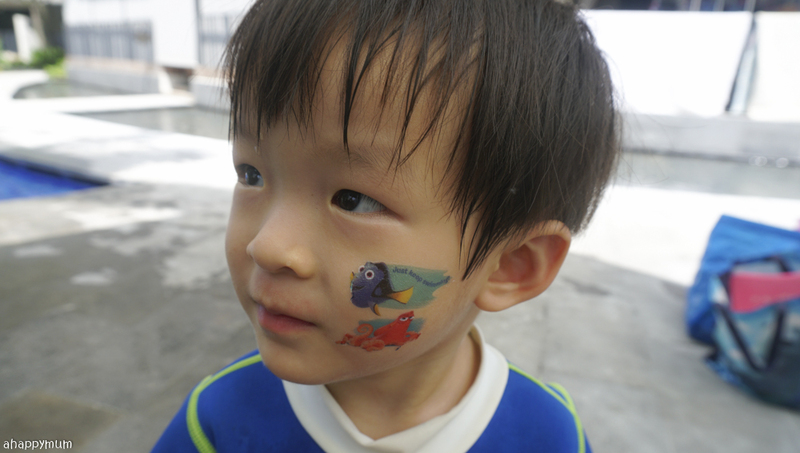 To get the kids into the party mood, we started off with some tattoos and the birthday boy was so excited to have Dory planted on his cheek! Haha. Here comes the chef! 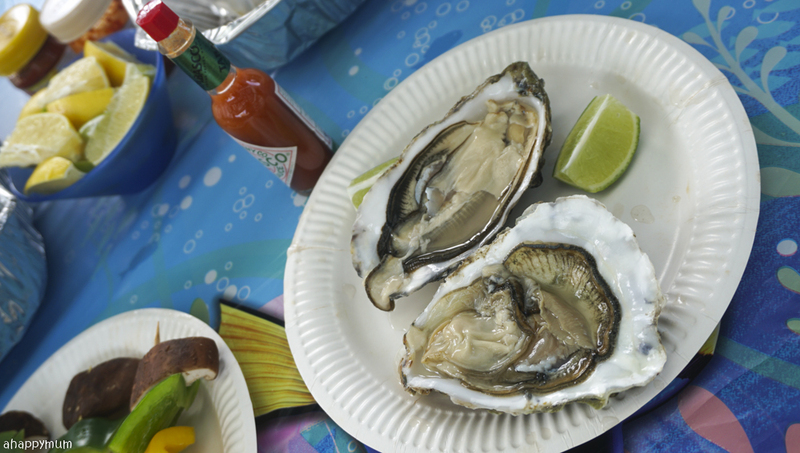 He loves to get fresh oysters as a treat for the guests and would just put some lemon juice and a dash of tabasco sauce. Everyone swears by how fresh, juicy and yummy these are! It's just too bad I never did like them, not even when everyone said how tasty they were in Hamburg and I tried one of it only to realise that I really, really don't know how to appreciate a lot of seafood. Oh well. As long as the guests are happy, I'm happy too! And the BBQ begins! I can't even start to describe how much I love the smell of barbecued food, nothing really beats it. 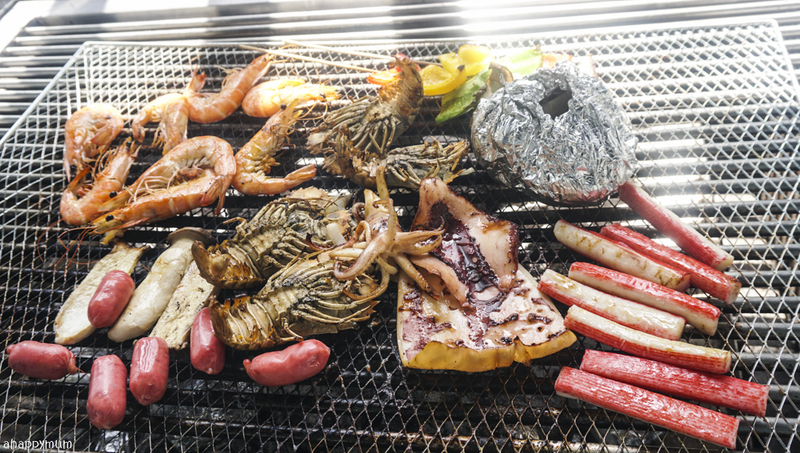 The hubby and our parents had prepared almost everything you could ever ask for - chicken wings, prawns, mushrooms, fish, pork fillet, crayfish, sting ray, crabsticks, squid, sausages, corn, sweet potato and more. Yes, it was definitely a BBQ feast all right. 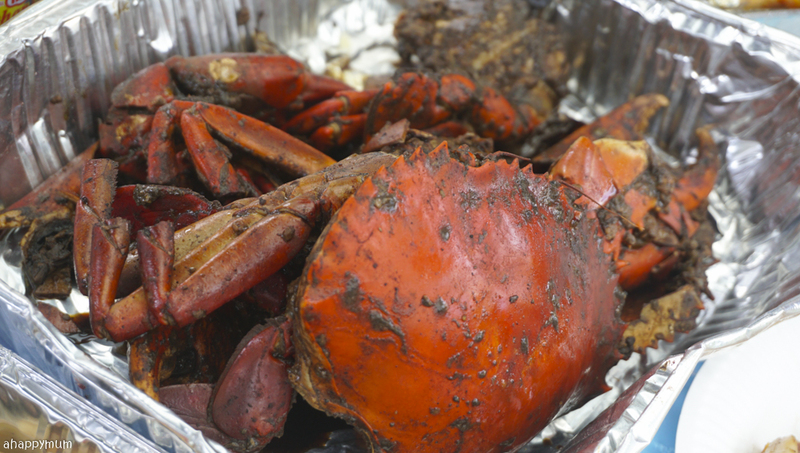 If those aren't enough, we even have these pepper crabs brought over all the way from Malaysia. Yummy! 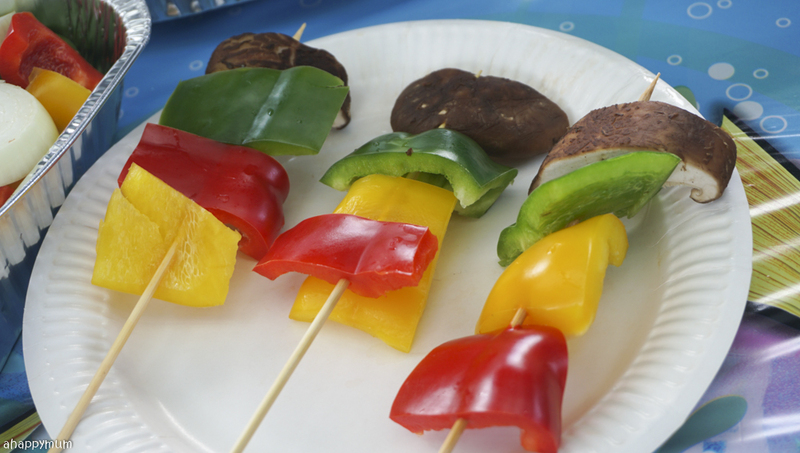 I love BBQ and pool parties because you can eat, dip, eat, dip and just repeat. We were so lucky that the weather was bright and sunny that day because I really didn't know what we could have done if there was a heavy downpour. Phew! 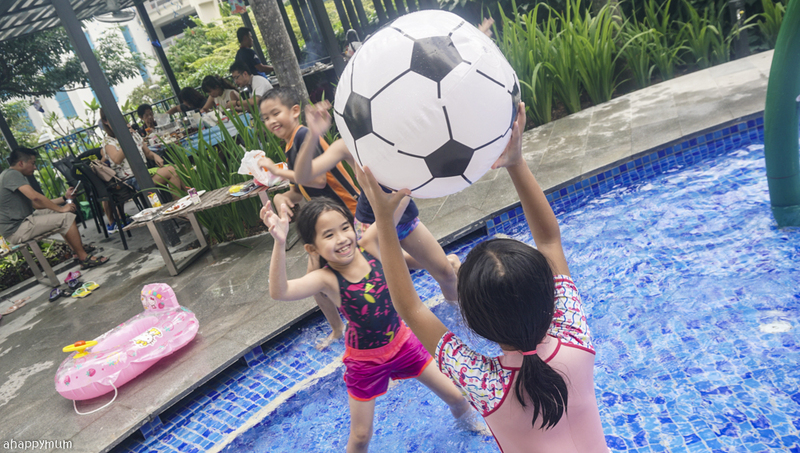 In fact, it only started to drizzle when the party was wrapped up and the kids had an extra hour of swimming in the deep pool. Yes, lady luck was shining down on the birthday boy for sure. 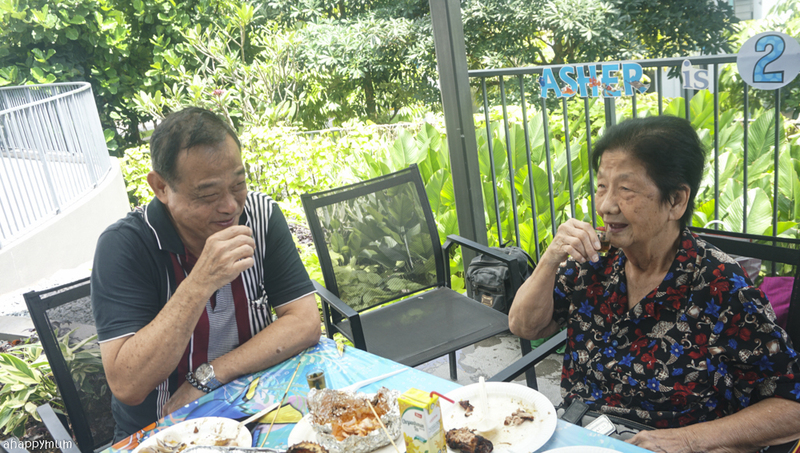 One thing that warmed my heart was seeing how my 83-year-old grandma made an effort to come and had fun chatting, drinking and catching up with everyone. 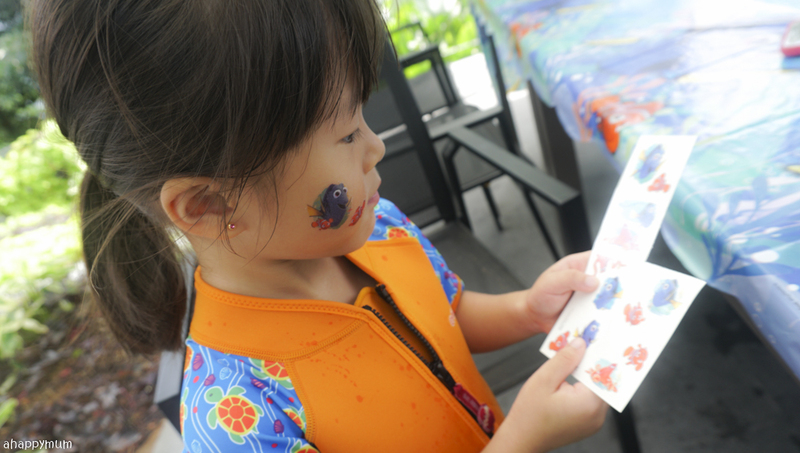 She might forget us from time to time and not remember our names or who we are, but we will never forget how much we love her and how it's a joy and honour to have her gracing any of the kids' birthday milestones. Woohoo! Our guests have arrived! The boy was stoked to receive birthday presents even though he still doesn't really know what it all means. Haha. It's the same as how while his sisters were excitedly ripping off the wrappers from their Christmas gifts, he was as cool as a cucumber and in the end they had to help open his gifts too. But you know what delights him most? 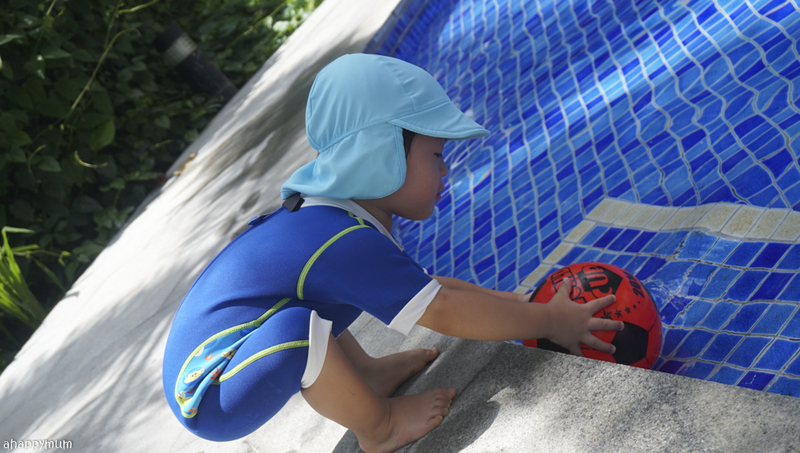 Water and a ball! 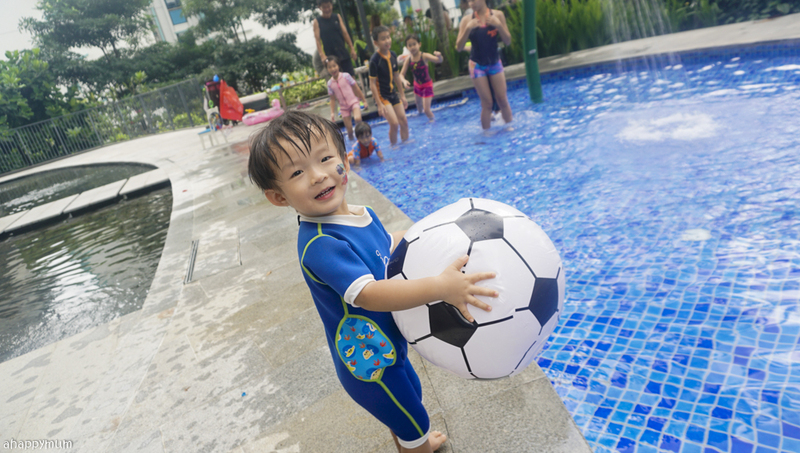 Yup, this boy loves splashing around and having a fun time in the pool, which is why this birthday party suited him to a tee. 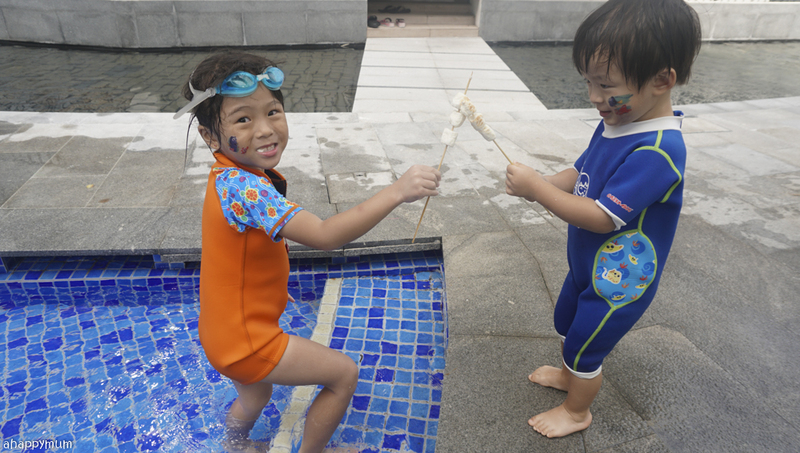 So, while all the adults were busy tucking into the food and enjoying the company (except for the hubby who was the BBQer the while time), I got the kids to come together to play some games! That, in addition to having to feed the kids and be the event photographer too, explains why I didn't get the chance to taste most of the yummy food though I would have loved to. Oh well, the things we do for our kids, right? 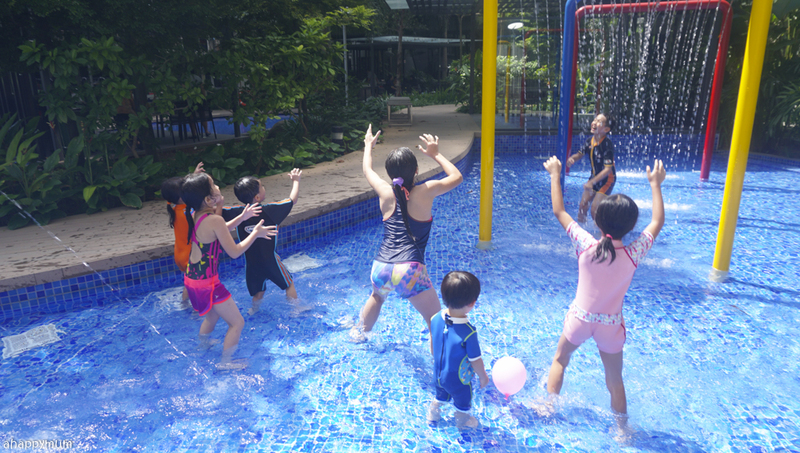 Anyway, the kids had ages ranging from 2 to 12 so I must tell you, it isn't always easy to think of activities that will suit everyone. Usually, either the younger ones would find them too hard to comprehend or the older ones would deem them as too easy and childish. 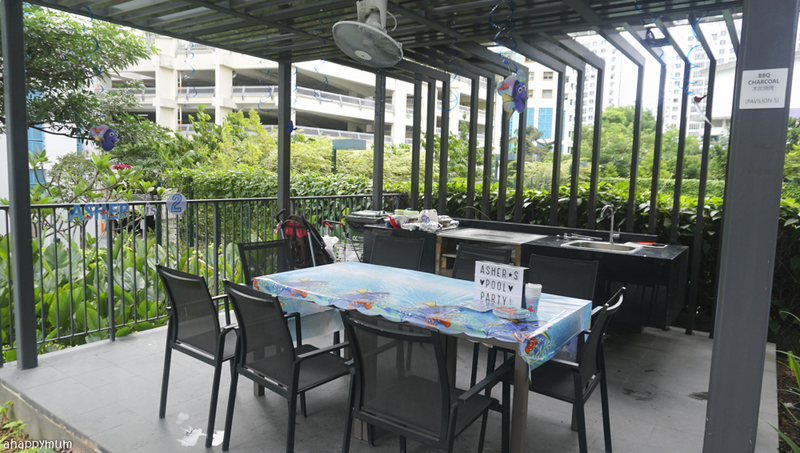 I find it tough to strike a balance but that is also why party planning is challenging yet fun! 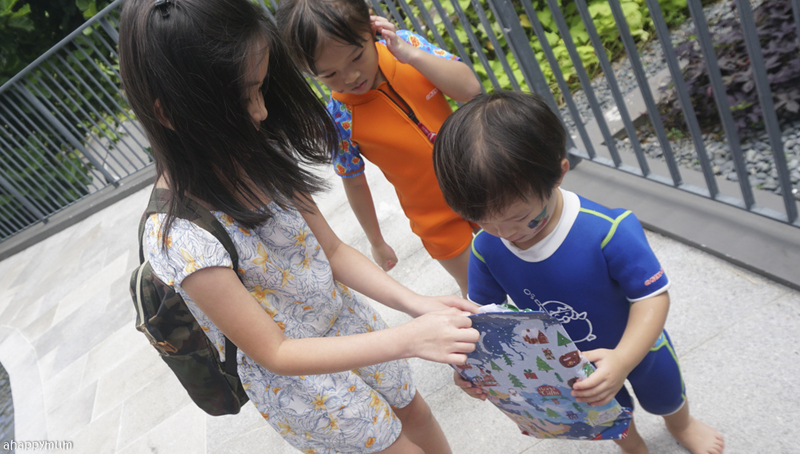 For this party, which took place just a day after Ariel's Shopkins party (will blog about that very soon), I kept our games to a minimal but still, I wanted the kids to come together to have some bonding activities. The first game we played was easy - Throw the Ball though the Hoop! 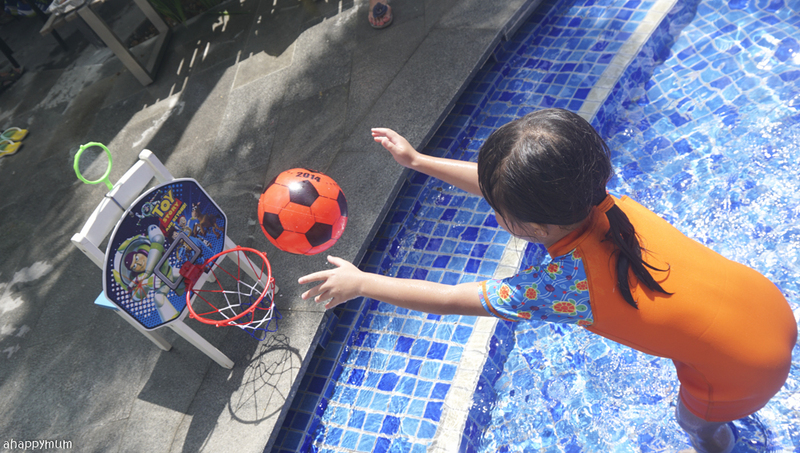 I used a wooden kid's chair and basketball hoop for this and the kids were supposed to stand inside the pool to shoot. The older you are, the further you have to stand away from it. We would then count how many attempts each of them took before the ball went into the hoop to determine who was the sharpest shooter. Next, I wanted a team building sport so we decided to play Water Captain's Ball! The kids were paired up according to their ages (the ones closest in age would pair up) and they would each choose either Apple or Orange. So we ended up with two teams who were fairly distributed in terms of age groups and since we had seven kids, guess who was the odd one out? Haha, yes, the birthday boy who doesn't really know how to play the game but was happy every time he got to throw the ball. So he was a member of both teams because well, he would just throw the ball - we used a huge, inflatable ball to be safe - to anyone and everyone. 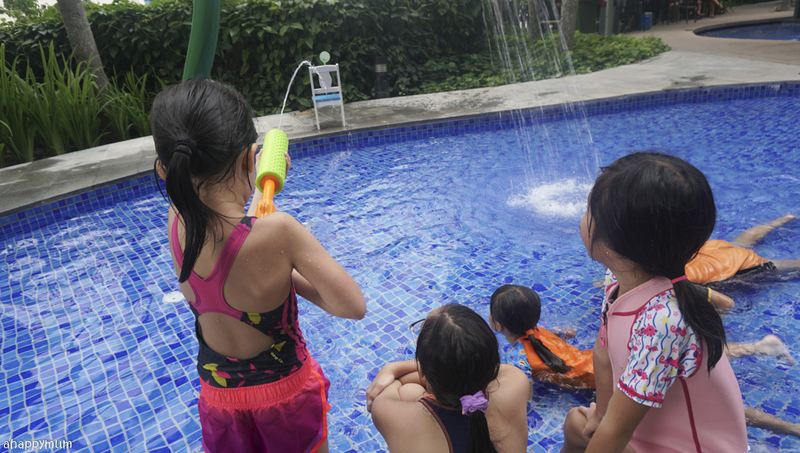 Our last game was a really fun one where players were tasked to Shoot the Target using water guns. 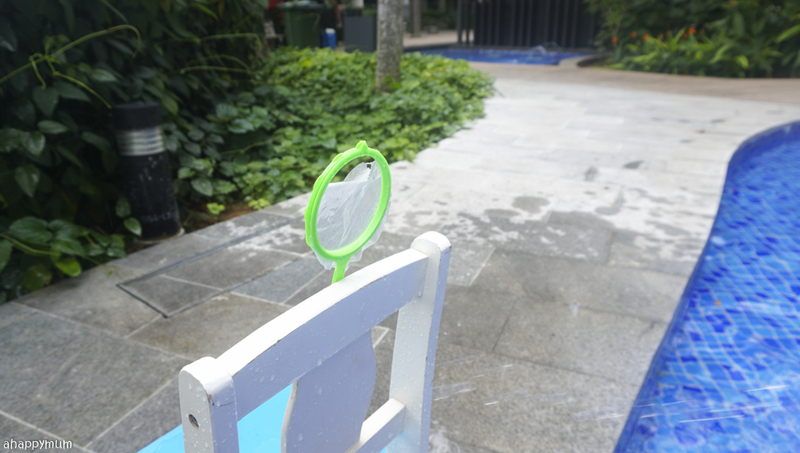 I bought this cute fishing net like thingy from Daiso which came with a dozen pieces of thin paper so the kids could take turns to shoot the target which was stuck onto the chair using sticky tape. Once there was a hole in the paper, you win! We would count how many tries each of them needed before the paper broke. This was definitely a game suitable for all ages because I would have loved to try playing too! Fun, right? We ended off the BBQ party with some roasted marshmallows and a group photo. 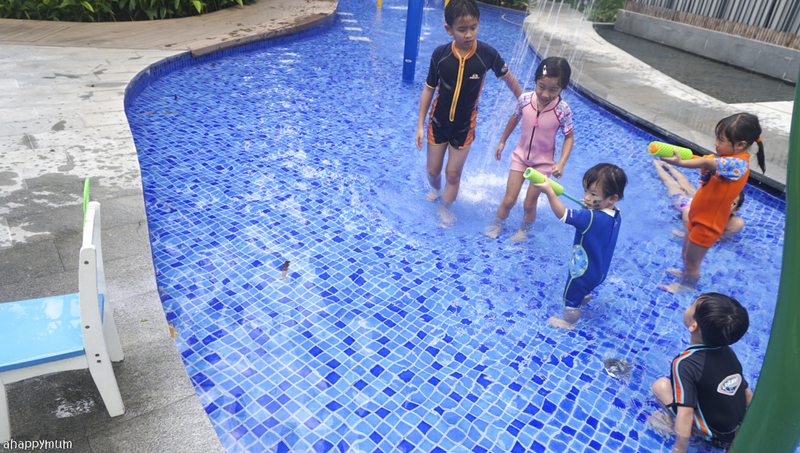 Oh wait, the party didn't really end yet because the kids wanted to go and swim more and we still had the cake cutting ceremony in our house! That's the thing about having family over, everyone wants to stay on longer and catch up more so no one was rushing to go off that day, not even my grandma. 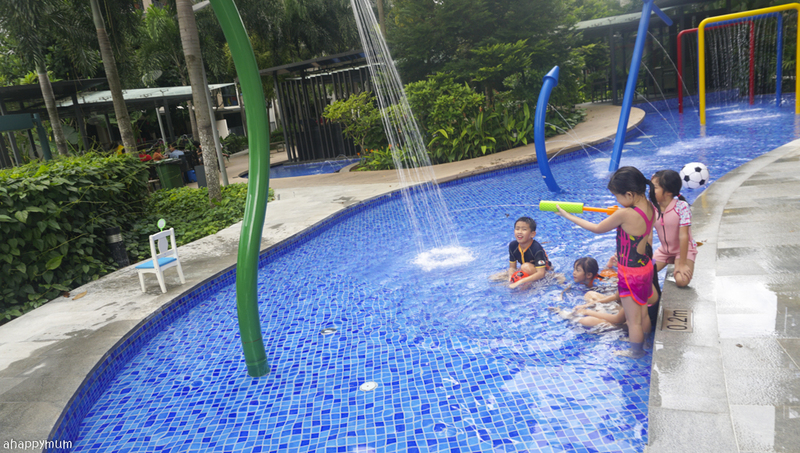 Thus, after a good long swim and some water gun fun at the pool, we made our way back home and the kids had a nice, warm bath before we proceeded to the highlight of the party. 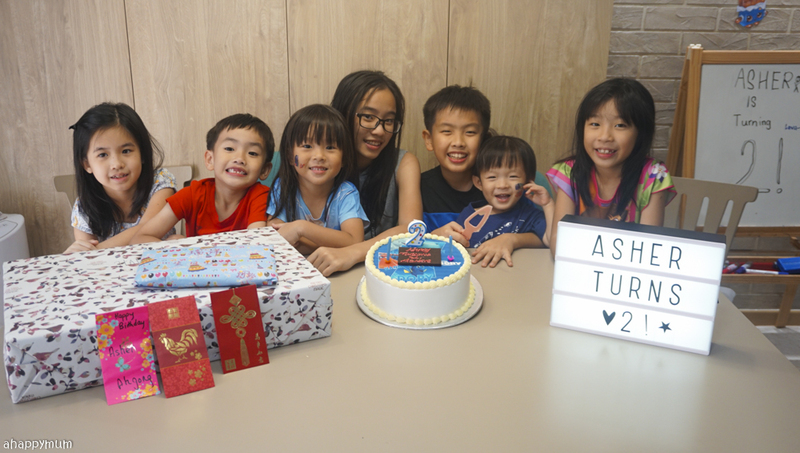 Yup, it's time to do what you love to do best, dear Asher - blow out the candles! I know all kids love this and your jiejies love it too, but you, my boy, you take it to a whole new level because you never ever get tired of it, you are always so enthusiastic when you see a cake, and the first song you can hum is no wonder the "Happy Birthday" song! The cake we chose was a Valrhona Chocolate cake from Bengawan Solo. 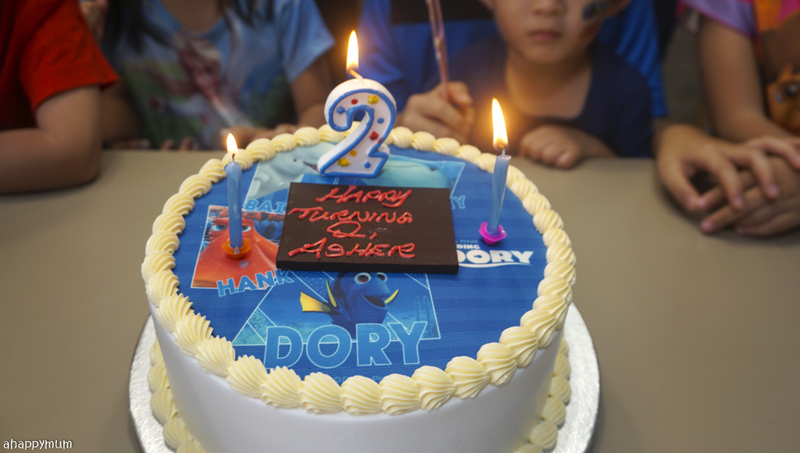 I was so happy we found one with a Finding Dory design and this cake was so yummy that everyone loved it, even my mum who very rarely eats cake, so that was surely the highest level of compliment. As for the birthday boy, he was just so happy that he finally got to blew out candles on a cake that belonged to him. Again, and again, and again! As for me, I found it a little bittersweet (okay, mostly still sweet) to realise how big my baby has grown already. Terrible Twos, I'm so not ready for you! 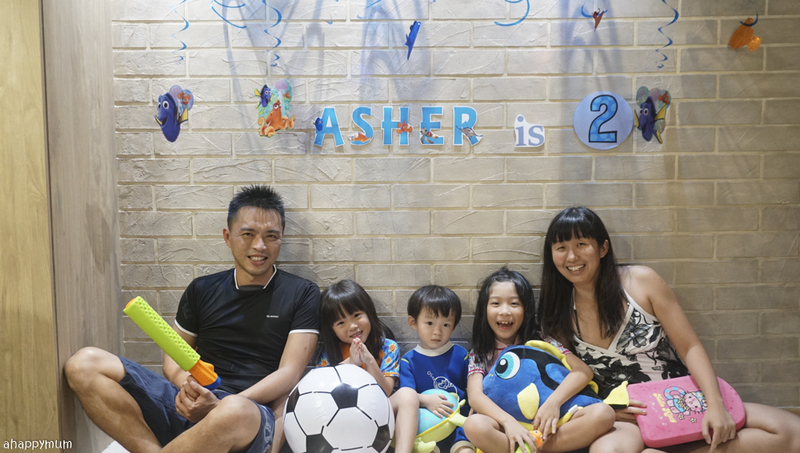 A big thank you to all the family members who helped to make this party a successful and memorable one for Asher and all of us. 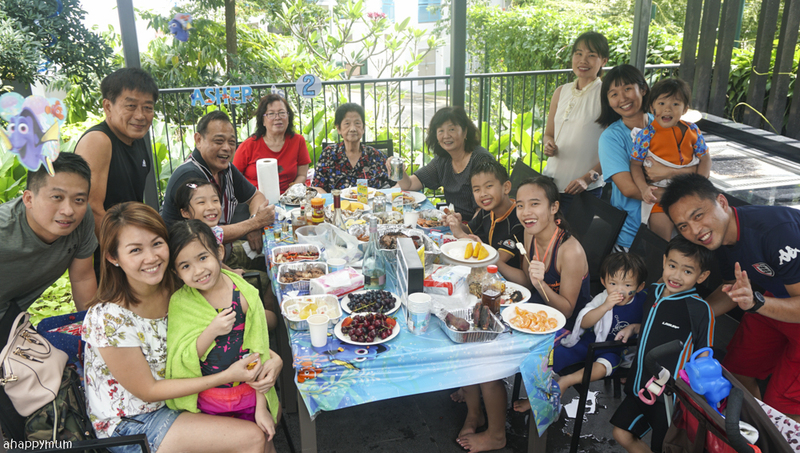 We are so glad that everyone had a truly awesome time and this is the kind of cosy, fun-filled party that we won't mind hosting over and over again if everyone, especially the kids, enjoy it so tremendously. Family is everything! 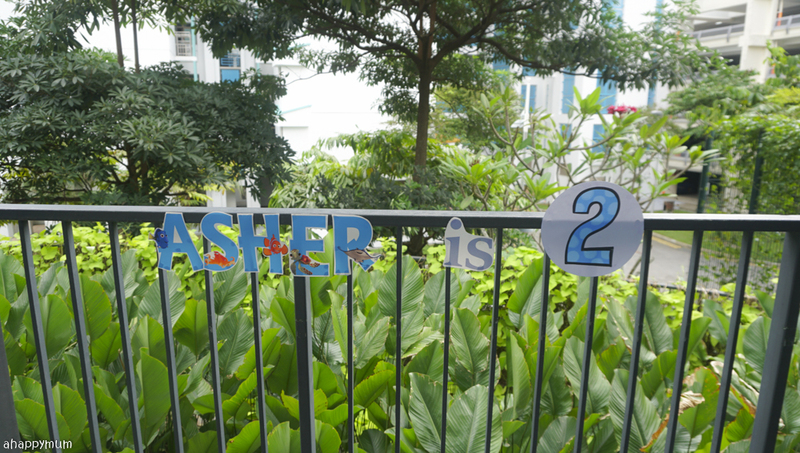 Dear Asher boy, happy turning TWO! We love you so, so very much and it's our blessing to have you in our family. Stay happy and healthy always and always spread joy to the world with that charming smile of yours. 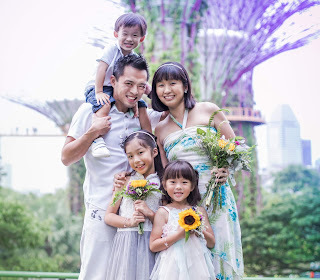 With lots of love from Mummy, Daddy and your dearest Jiejies! 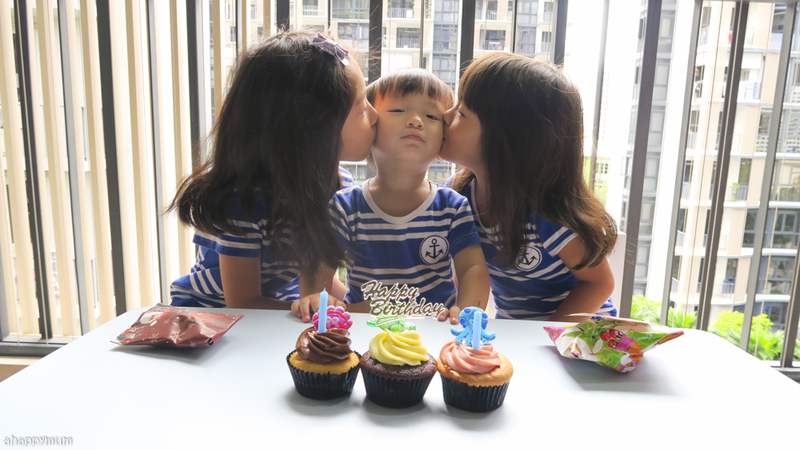 Till my next birthday party and more hugs and kisses to come!